Who doesn’t love a deal? My two favorite days of the year for scoring a race registration discount? National Running Day, which takes place annually in June, and CYBER MONDAY!!! I am not a shopper, so Black Friday means nothing to me other than the best day of the year to avoid crowds. But Cyber Monday, now, I can get into that! Deals, specials, discounts on everything from carpeting to compression socks, Hi Res TV’s to running shoes, and best of all? Race discounts!! Many race directors take advantage of this special online buying day to offer up one-day-only deals off race registration. It’s simply one of the best days of the year to sign up for your next race, your next marathon, your next destination race weekend. So get ready! I know of a few races that are planning big discounts. Discounts too good to pass up! So, keep your eyes on Facebook and Twitter come Monday, and get to Googling first thing in the morning scouring the internet for those deals! 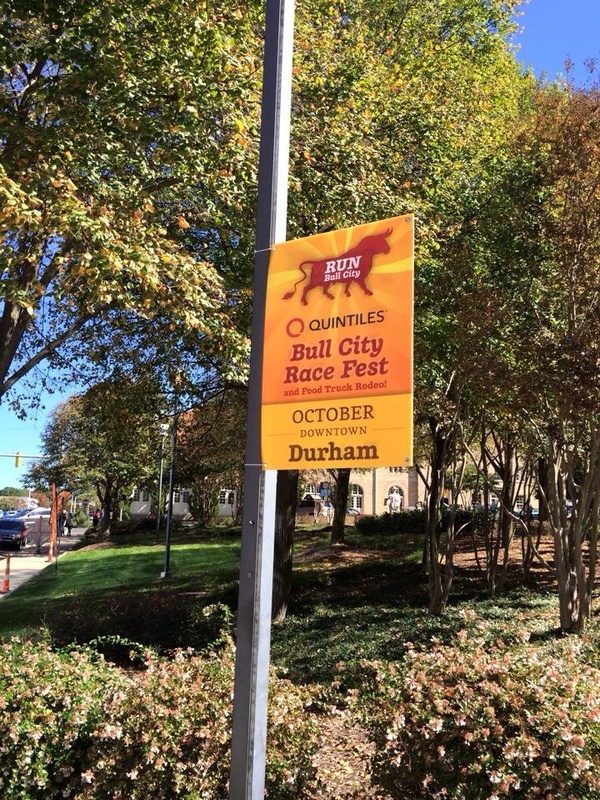 The Bull City Race Fest is an amazing event, and was held for the third time in Durham, NC, on October 18, 2015. 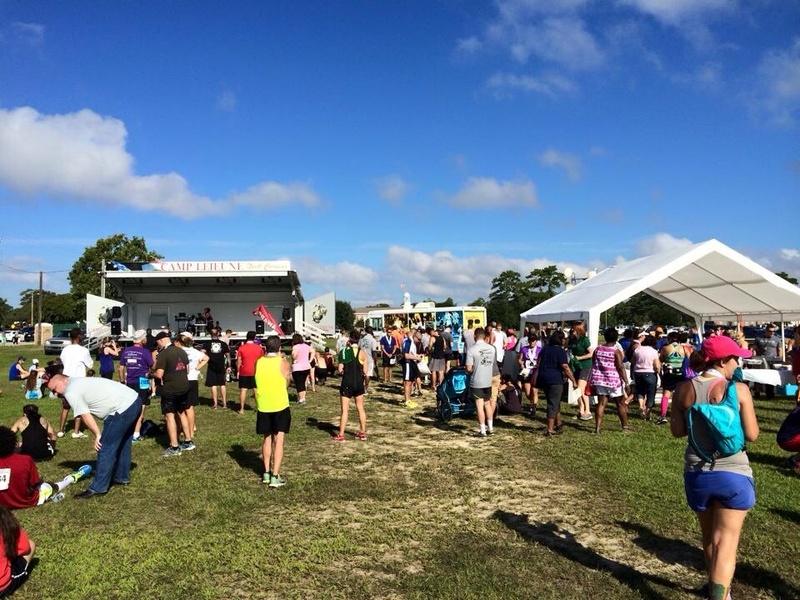 The event includes a 1 mile, 5 mile, and signature Half marathon distance race. It is truly an amazing event, that has gained popularity each year. This race has it all! It is very family friendly, and one that I would recommend to any runner looking for a world class running experience. 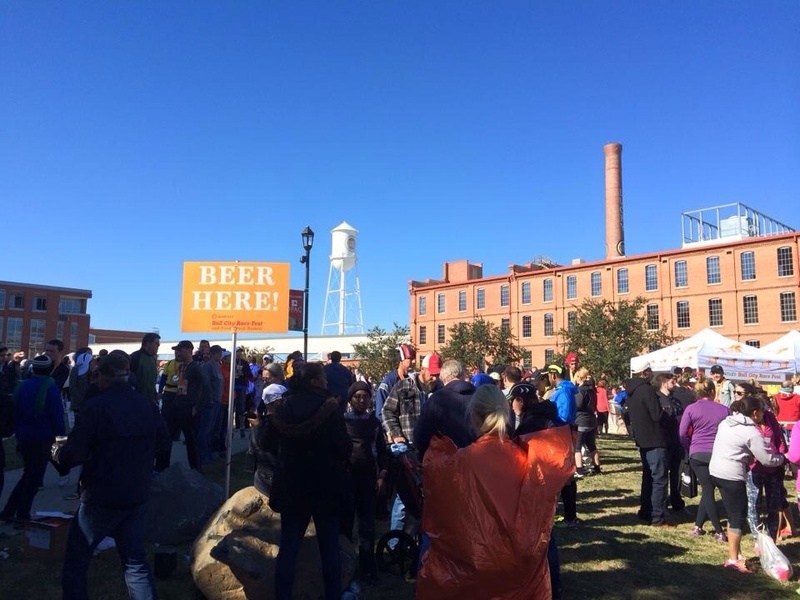 Everything from the ease of packet pick up and expo, to the post race food truck rodeo and relaxing finisher village. The highlight though in my eyes, is the race itself. The course, with all of its hilly challenges, is both scenic and exciting. This race was both a recovery run from my Chicago Marathon a week ago, and my final longish training run for the New York City Marathon just 12 days away. 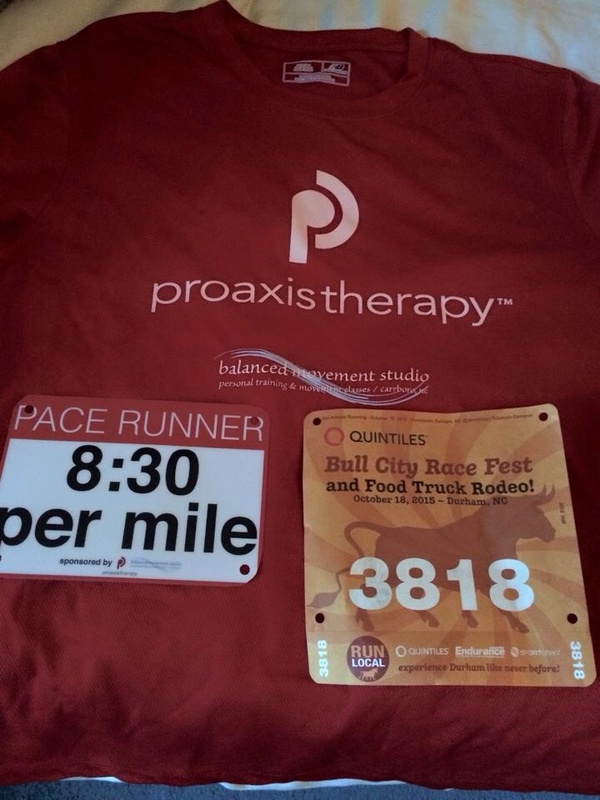 The perfect way to run this race for me was to be a pacer! The opportunity to pace it didn’t come until just a few days before the race itself. I quickly jumped on it, and signed up my son to pace, as well. This would be his first time pacing, and probably around my 10th time pacing a Half. The best part? Pacing together as Dad and Son. In the same pace group, pacing the 8:30 (or finish time of 1:51:25). Two years ago I paced the 1:45:00 finish group, so I knew the challenge of the course, and knew that we could both easily handle the job. Race morning went off without a hitch. Parking was easy and we made it to the starting line for some pre-race photos with the pace team members at 6:50am. The race was to begin at 7:30, so we had a chance to stretch and use the bathroom and get lined up with our fellow 8:30 pacers in plenty of time. A cold front had come through our area overnight, and we had unusually cold temperatures for race morning. It was like 36 degrees, so we tried to stay warm until the start. It had been so long since running in temperatures like this it was kind of exciting. When the sun rose, the sky was cloudless and blue. It was going to be fun! 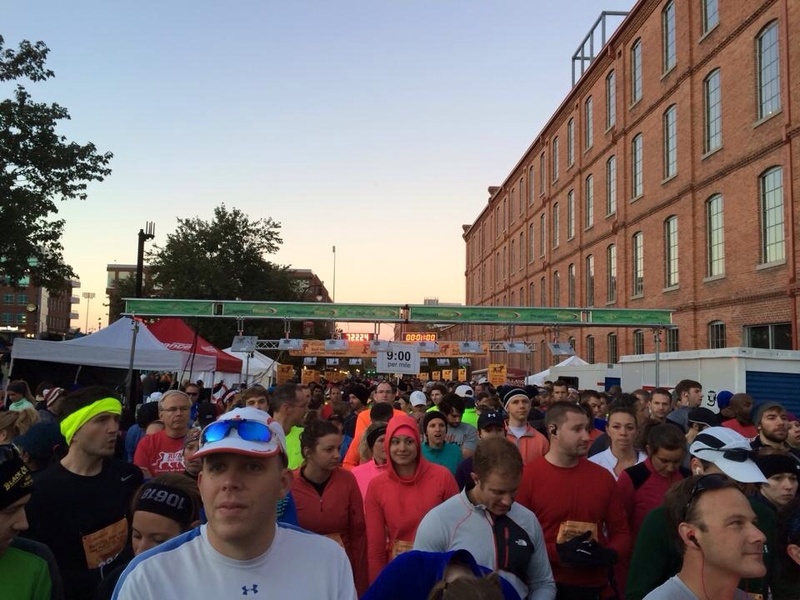 The Half Marathon had over 2,200 people running and it was obvious when we all began lining up. It was a sea of runners both in front of us and behind us. I think we had 6 pacers in our group alone. We talked some strategy on how we would pace the group right up until the gun went off. With a challenging course like this one with all of its hills, I knew I wanted to be a few seconds ahead of target pace. The final few hills can be PR killers, so staying one or two second ahead throughout the race would leave us in good standing for the final mile. 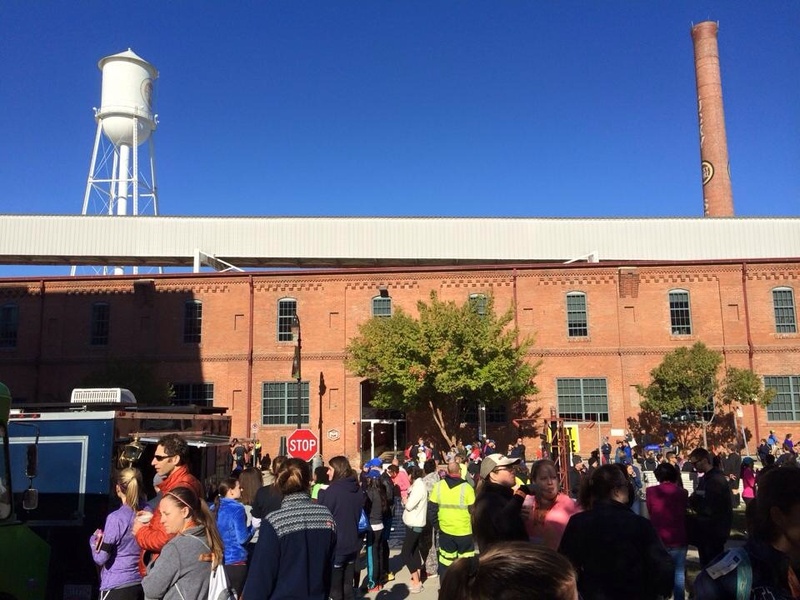 The first few miles are crowded, and run through downtown Durham. You get a taste of the hills right from the start. We nailed our target pace though right from the start. We talked a lot with the group, but it was also obvious right from the start that we would be pacing about 40-50 people and we were all spread out. I think the most exciting thing for me was how into it my son was. He has a few trepidations about pacing when we first talked about it, but after I convinced him that he had everything it took to be a fantastic pacer, he really warmed up to it. He was very excited! I told him to stick as close to me as possible, but the excitement of the race had him out in front of me a ways quite often. The course continues on trough Trinity Park, and Duke Campus, hills abound. With every uphill though comes downhills, and it’s a really nicely varying race. Occasionally there were neat signs along the course, and chalk drawings and encouragements on the road. Our group waxed and waned, but our pace was right on the mark. It was such an enjoyable run. Offering words of encouragement to runners as they passed me, or encouraging every runner up the numerous hills. The weather was so cooperative that I never felt like I needed to stop for hydration along the course. I did, however use my GU’s at miles 5 and 10. As the final mile approached and we were nearing the finish I started turning and running backwards to encourage runners behind me to push hard and pass me. My son and I met up side by side with about a half mile remaining. I wanted to be as close to the target of 8:30 as possible without going over so I ran backwards for pretty much the majority of the final tenth of a mile. I have so much fun getting those racers to the finish! Pacing is a truly awesome way to pay it forward. 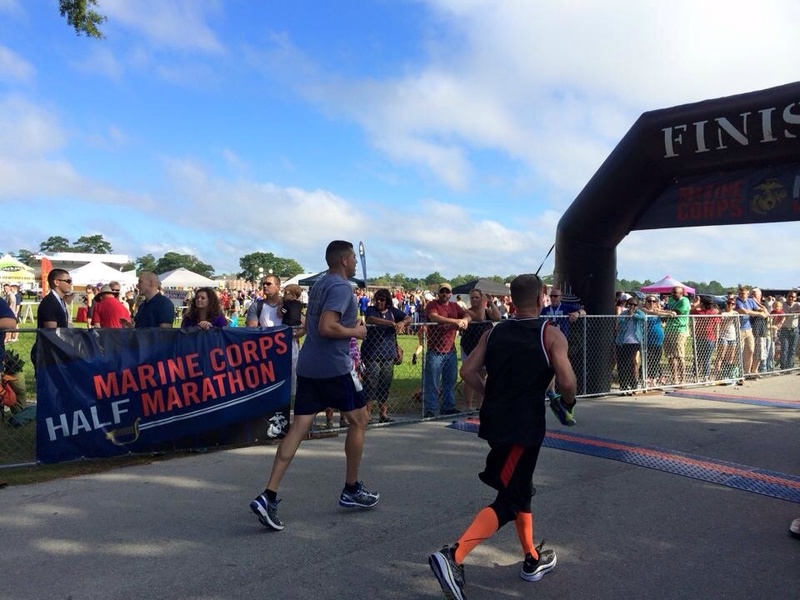 I crossed the finish line in 1:51:14. Eleven seconds under our pace goal. Perfect! 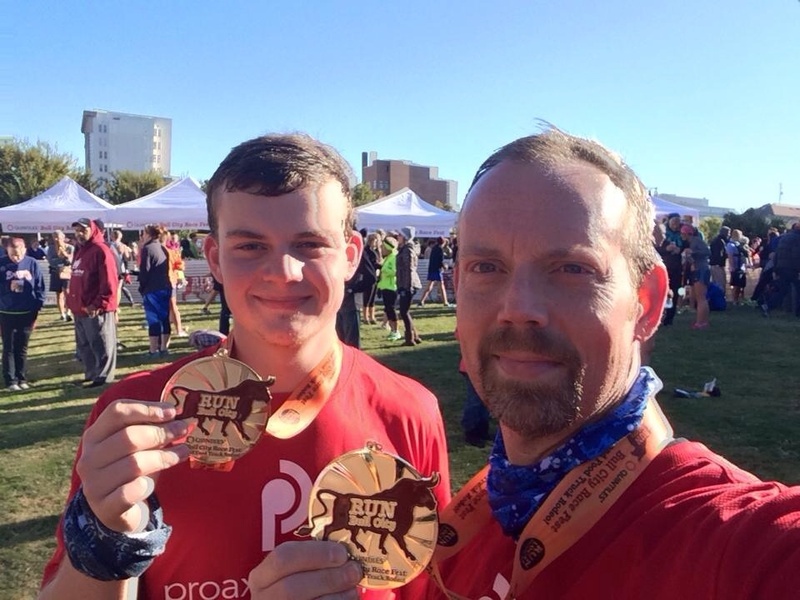 My son finished about 45 seconds under the goal, so we were both within a minute under. After the finish we were stopped numerous times and thanked for our pacing efforts. I know several runners even had personal bests on that tough course, so it’s super satisfying to me. The post race village is amazing, and absolutely packed with runners and families. 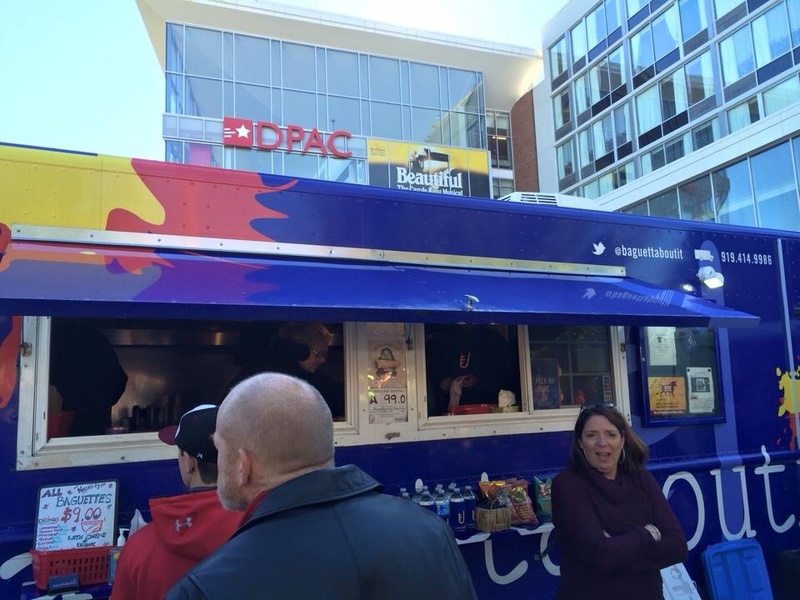 Food trucks all over, lots of refreshments and food. It was the perfect day for relaxing and relishing in a victory of the course. Durham is such a fun happening city. Relaxing on the lawn in front of the Durham Performing Arts Center (DPAC) was so much easier after we ran back to the car to change out of wet shirts and grab a jacket. It was chilly! Well, it felt down right cold to me. A few more photos on the lawn to commemorate our accomplishment, and a visit to the Baguettaboutit Food Truck before we called it a day and headed home. Don’t ask me how, but I knew about ten people racing that day and managed to not bump into any of them after the race. A bit of a disappointment, but there will be other races to meet up. I had the best time with my son pacing that day. I only hope the opportunity comes up again sometime. Every now and then something really special happens. Something that just doesn’t happen every day. This coming weekend one of those moments in time will occur for me. Most of you know that I love to pace races. 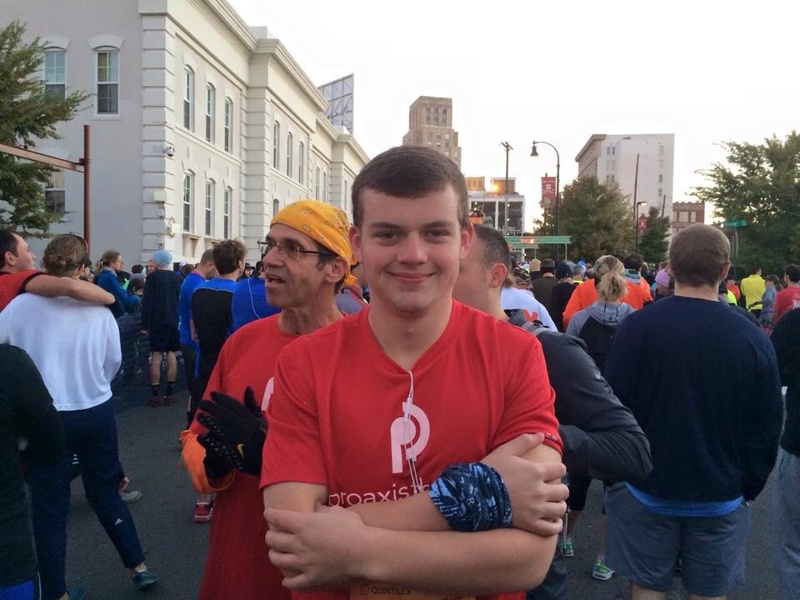 I will be pacing a marathon for the first time in 2016. I’ve had opportunities to do this in the past, but have just not jumped at it. Half marathons though are another story. I think I’ve paced somewhere around 10 Halves over the past few years. It’s such a fun way to give back to my fellow runners and the running community in general. The unique opportunity that I am talking about is kinda cool. 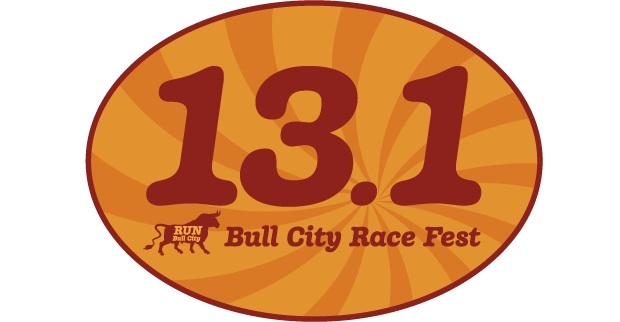 This Sunday, at the Bull City Race Fest Half Marathon, site of my first pacing experience a few years ago, my son and I will BOTH be pacing. We are pacing together! Father and son. We are pacing the 8:30 per mile pace group. This will be my sons first pacing job. I cannot wait, it is going to be so much fun. Pacing together will give us the unique opportunity to run side by side for the entire 13.1 miles. Normally he is out in front of me, or he is running a Half and I am running a Full. This time we get to run together, be vocal, and help our fellow runners get to the finish line. Talk about a unique opportunity! Thanks to Bull City! These race photos should be really great! 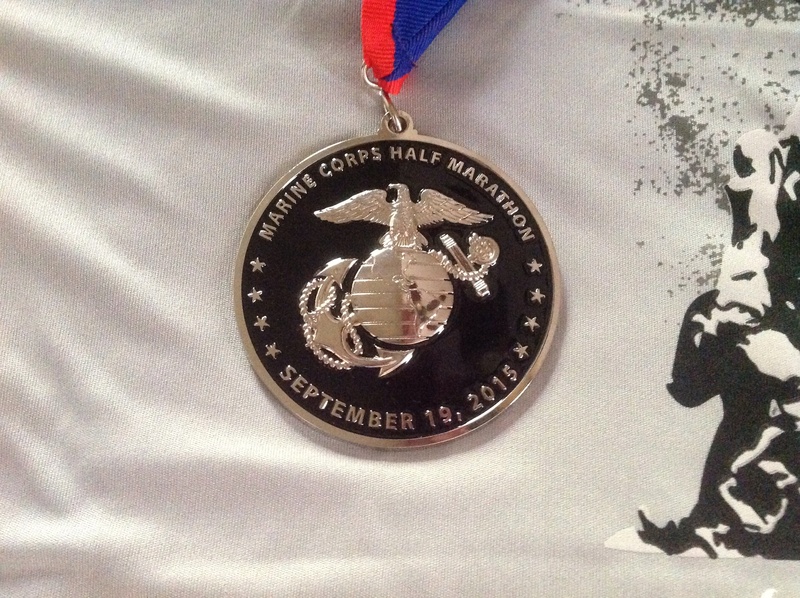 Oh, and I haven’t forgotten about a recap for the Chicago Marathon. I have been gathering my thoughts for a few days, and as soon as I have enough time to write them all out I will. Just a small teaser though, it was another fantastic time in Chicago. An amazing race of epic proportions. If you haven’t, you’ve got to put Chicago on your race calendar! The world is full of all sorts of challenges. Inequality, extreme weather and climate change, economic collapse, oil and water shortages, hunger, among many, many others. Over the last 50 years the human population has nearly tripled, and with that come epic challenges that we all must face as inhabitants of this beautiful planet. These challenges though cannot be overcome in a day, or two for the matter. It will take years and years of hard work. We may never see full solutions to these challenges. Ever. Wait…. this post is meant to be light. It’s about challenges. So let me change the focus of our challenges to the good kind. Challenges we look forward to, challenges we take on with gusto. Challenges we set out to conquer! I am a runner. My main goal today is to let you know about a new challenge for the running community. 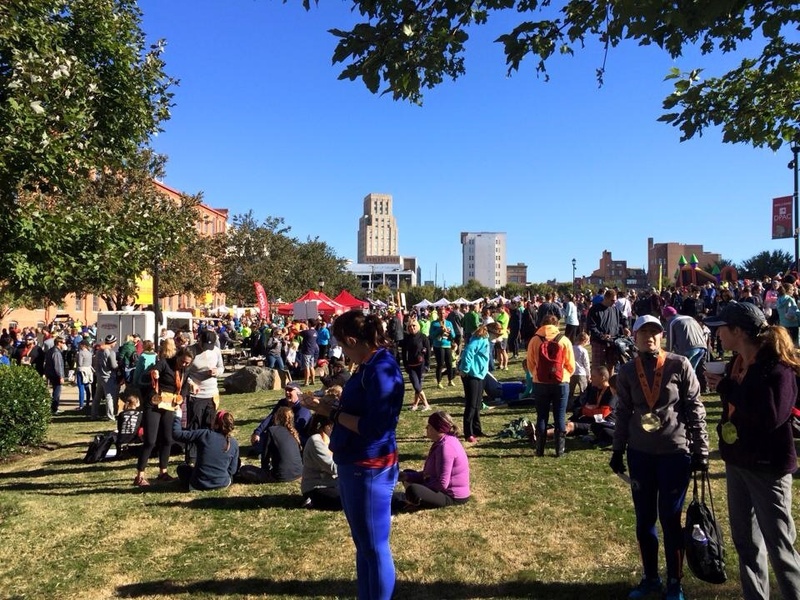 As the population grows, naturally the runner population grows. We are an ever growing and ever changing group. We are challenge seekers, and often find ourselves setting higher and higher standards for ourselves. We can, we will. Never give up. A few mantras I’ve heard lately. In working with the running community and getting to know so many of you through running races and social media, my love for our sport has grown and grown. 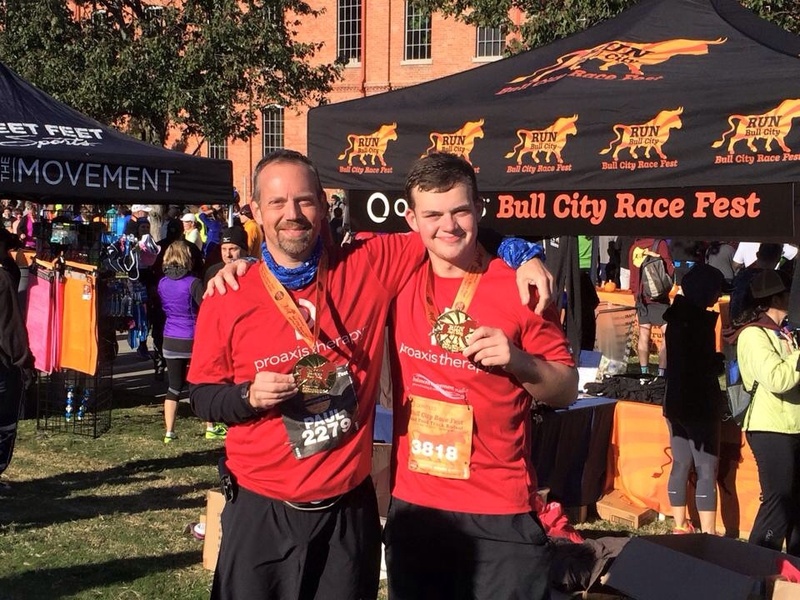 When I run a great race, I want to tell everyone about it. It’s really the reason I started blogging about my running in the first place. 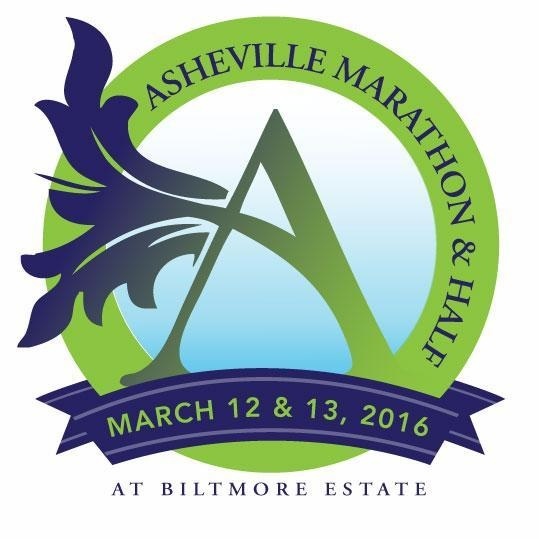 So, let me share with you some news about the Asheville Marathon & Half at Biltmore Estate today. This race has grown and grown in popularity in the last few years. Why? Location, swag, race course, yes, all of those. An amazing event which has sold out each year. For 2016, the races will be held on separate days. An exciting weekend event. 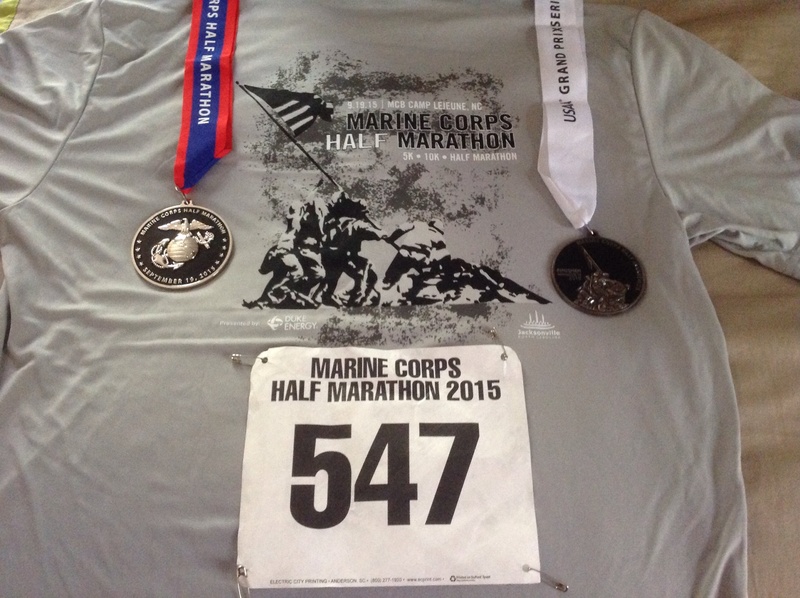 The Half Marathon on March 12th. The Full Marathon on March 13th. But wait! (Herein lies the challenge I’ve eluded to) Run both! The Backyard to Vineyard Challenge. Run both races on back to back days. IDaph Events, which puts on this fantastic event (among others), recognizes the need to reward runners of all kinds. They welcome the first time Half Marathoner, they welcome the very seasoned Marathoner. They don’t discriminate. This year they are recognizing those of us who love a challenge. The Asheville Marathon & Half is now offering special discounts to Marathon Maniacs and Half Fanatics who may just want to descend on Asheville and take on a new and exciting challenge. I think it’s very cool when a race recognizes the running maniac/fanatic in each of us. These two groups consist of approximately 24,000 runners worldwide, and growing. So? What are you waiting for? 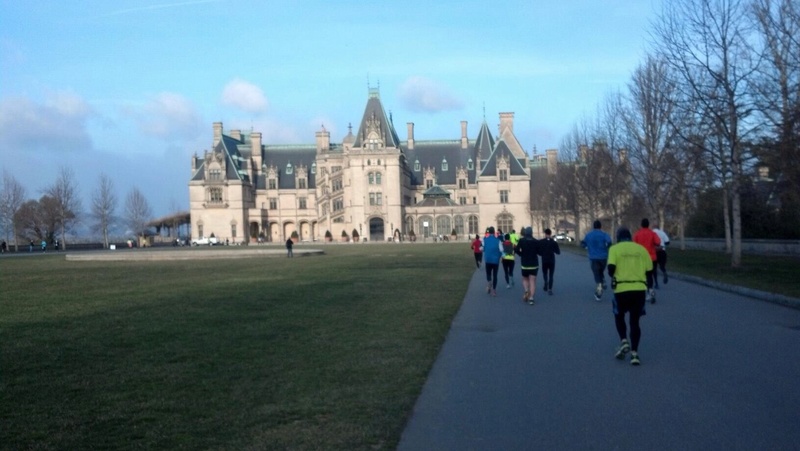 Jump on the bandwagon and score some awesome discounts to run at the Biltmore Estate next year! They are celebrating us runners, so let’s take them up on it! 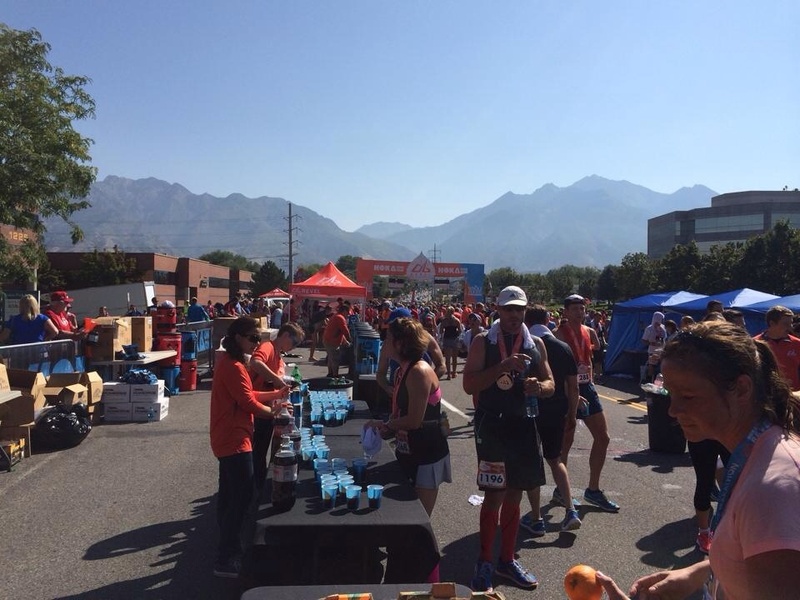 Registration is already open for Big Cottonwood Marathon & Half for 2016. Talk about a jump start! The 2015 race was just a few weeks ago. They open it early so that folks can plan in advance, and get in on the lowest pricing. With that being said, current pricing is as follows, and will stay at this price until 4/12/16. 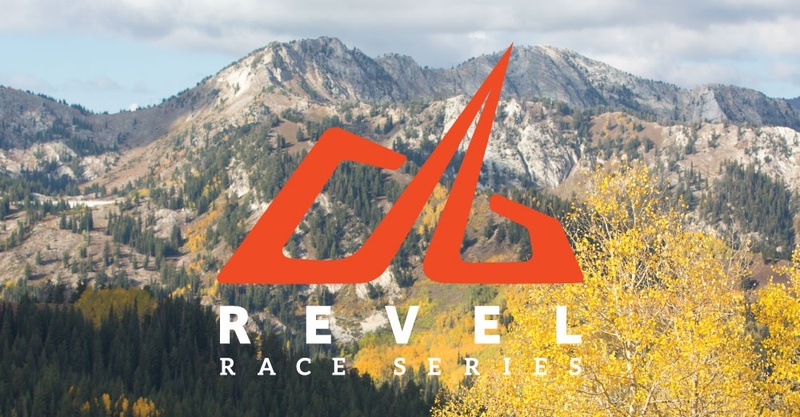 My plan is to head back to Utah for this race in 2016 (since it’s one of my absolute favorites) and have created a team that you can join for an even lower price. Joining my team gets you an additional $5 off current pricing, and if you “Like” them on Facebook during checkout they offer another $5 off. My team name is “Chasing Boston”, so when registering, just choose “join a team”, and enter that name. We don’t have to run together, but we can save money together, right? This past race I had over 20 people join my team, all saving money along the way. The Big Cottonwood course is a fast, downhill race that qualifies tons of folks every year for Boston, hence the team name I chose. So? What are you waiting for? Join in on the fun in Salt Lake City. 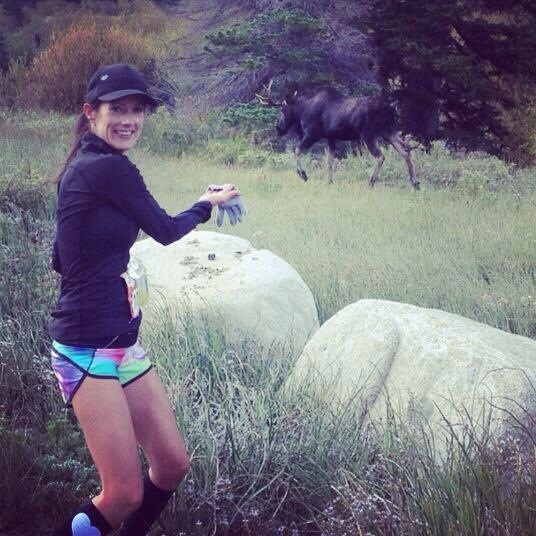 You may even see a moose or two during your race down Cottonwood Canyon. 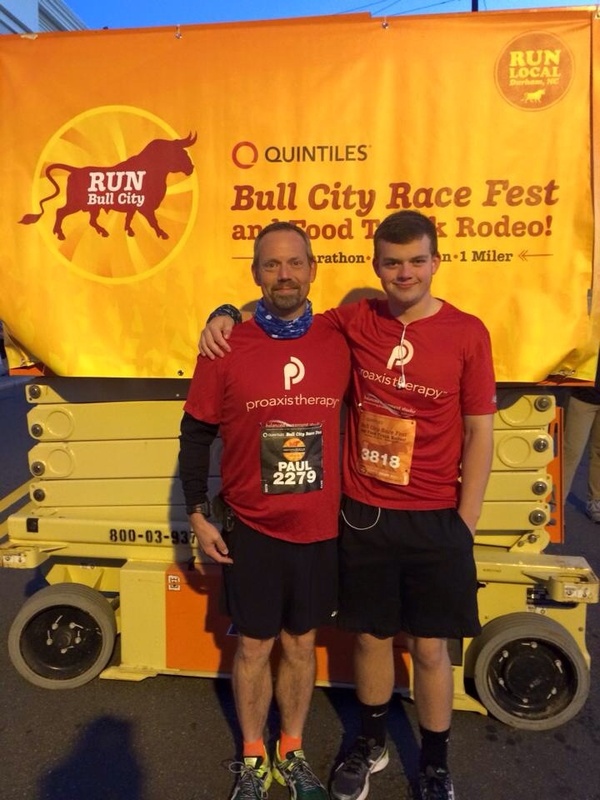 This past Saturday, 9/19/15, my oldest son and I ran an amazing race together. A new Half Marathon to us, but a tried and true tradition for years about a two and a half hour drive from home. This race has been on my radar for a few years now, but timing and obligations always seemed to get in the way. Not this year! Back at the beginning of the Summer my son called me and said “let’s sign up for a race”. You know me, I love running races with my boys, so I searched and searched to find us a race. 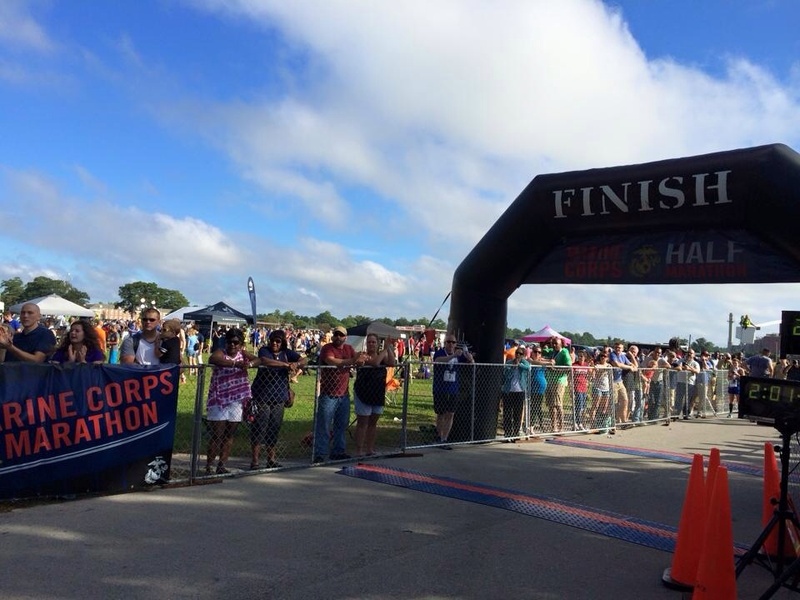 Because I didn’t have a September marathon planned this year, this Half Marathon at Camp LeJeune was the perfect choice. This race would be my sons 5th Half, and my 29th! The weather the week prior to the race was finally cooling off a bit. For a few weeks I had been able to get in some training runs in more moderately warm conditions versus down right hot ones. My son was taking this race very seriously. He has recently gotten a lot fitter, and had really taken training for this race to a new level for him. Based on the runs he had in the month leading up to the race, I knew if he had a good day that he would leave Dad in the dust right at the start. Time would tell. This race location is an interesting one for us. Being about 150 miles away from home, it seemed too close to commit to an overnight in a hotel, but meant getting up mega early on race morning to drive there. I chose to drive on race morning since they offered race day packet pick up. It was way more difficult to do this than I had ever imagined. We had to leave the house by 3am!! Yes, 3:00am. Ugh! It wasn’t a big deal to my son, who threw on some headphones, and curled up in the passenger seat. To me? Not fun! 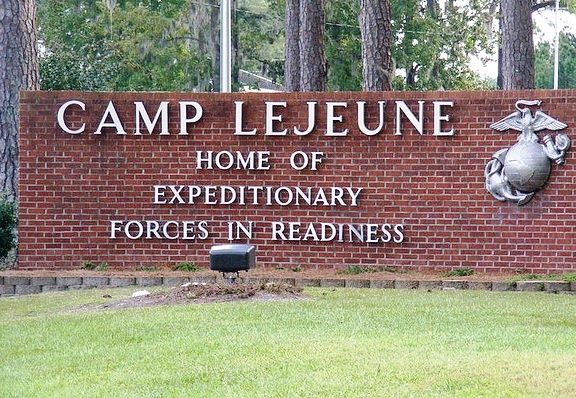 Because of added security measures at Camp LeJeune, they suggested we get there 90 minutes before the race. We had to submit personal info prior to the race like drivers license info, make and model of the car I would be driving, etc.. Getting there early would mean I would have the needed time to get my parking pass, find parking on base, pick up our packets, and get prepared to race. It all worked out just fine, it was just a very long morning. Our race preparations went as planned. I was a bit disappointed that the cooler morning temperatures of the prior week had decided to end abruptly that day. When I had gotten up at 1:30am, the temperature was 70 degrees. By the time the race started it was 72, and humid. We hydrated the best we could before the race began, and I hoped for the best. This race also includes a 5k, and 10k so there were plenty of runners everywhere. A very nice large holding area/finish area, it never felt too crowded but I knew that based on previous runnings of this event that there was over 1,000 runners there ready to race. We lined up at 6:45, and promptly at 7am, the race began. I told my son to race smart, and to hydrate and be sure to take his gels. Within the first 30 seconds he was well out in front of me. I hoped he hadn’t gone out too fast, only to lose it on the second half. United States Marines manned intersections and kept traffic under control. Since this entire race course was taking place in their home it was only fitting. The race course was quiet and mostly flat. I was clocking mile paces in the 7:30 range at the beginning. This would change, and all too soon. It was incredibly sticky outside, and by mile three began to feel more like I was running through a swamp and not running on the road. It was tough. The condition were not ripe for a brilliantly fast race for me, and considering I had run another Half Marathon six days prior, I wasn’t trying to set any records. I just knew it wouldn’t happen, especially with the heat of the morning. The race course was beautiful though. Several signs along the way, families in their driveways cheering us on. It felt cozy and warm. The section of the race course along the water was very scenic and tranquil. My race shirt usually gets soaked with sweat during a race, but this was extreme. My shirt was soaked by mile five, and my shorts were already getting that way. I had a guy pass me around mile five that was literally dripping from head to toe. He was drenched! I think he was almost leaving wet footprints as he ran by me. It was humid! I was enjoying myself though, and found myself hoping that I would never catch another glimpse of my son until the finish line. I wanted him to have a great race. He trained hard for it, and I wanted him to succeed. My race felt dauntingly slow. As my pace crept upward I made a goal to come in faster than 1:49:00, a mark I was using to pace myself the prior week at the Carowinds Half. I felt this goal was achievable, even in the heat. Beyond the midway point in the race the pack was very thin. I raced in and around the same group of guys for quite some time. We traded positions at every aid station. Water was every two miles on the course up to mile 8, and then every mile until the finish. I knew based on how much I was sweating that I had better take advantage of each one until the end. I would skip the last one. The later miles were tough. I just wanted to finish. The effort I expended during this race was far more than my previous race, and it was all because of the heat and humidity. It really zonked my energy. Nearing the end, I couldn’t wait to see my son. I wanted to know how he did. I never caught up to him, but found myself doing a double take at mile 13 when I ran up next to an ambulance and medics loading a runner onto a stretcher. Luckily it wasn’t him, but felt badly for that guy. Been there, done that. Not fun. Racing in these conditions can land you in the hospital if not properly prepared. The finish line finally in view, I managed to hold my pace under my goal. I crossed the line in 1:48:08. 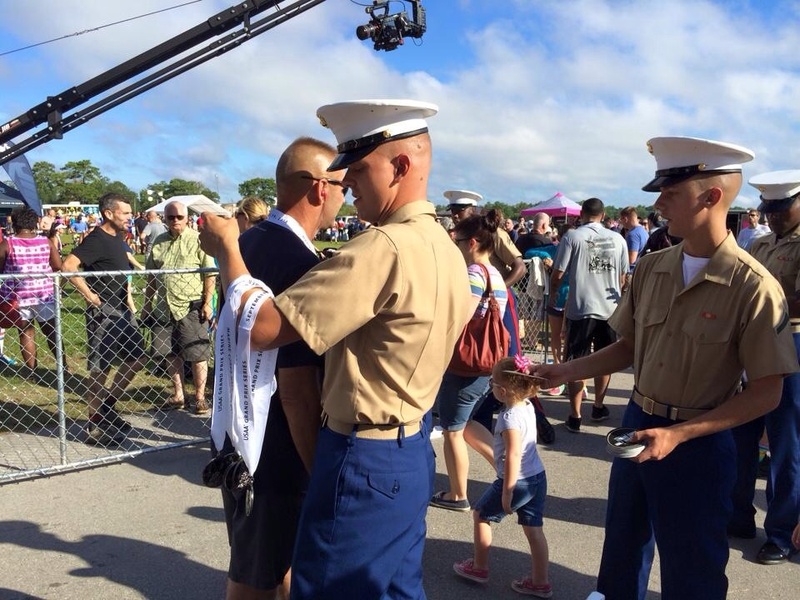 Receiving my medal from a U.S. marine in uniform was very nice! My son was there to congratulate me and tell me all about his run. 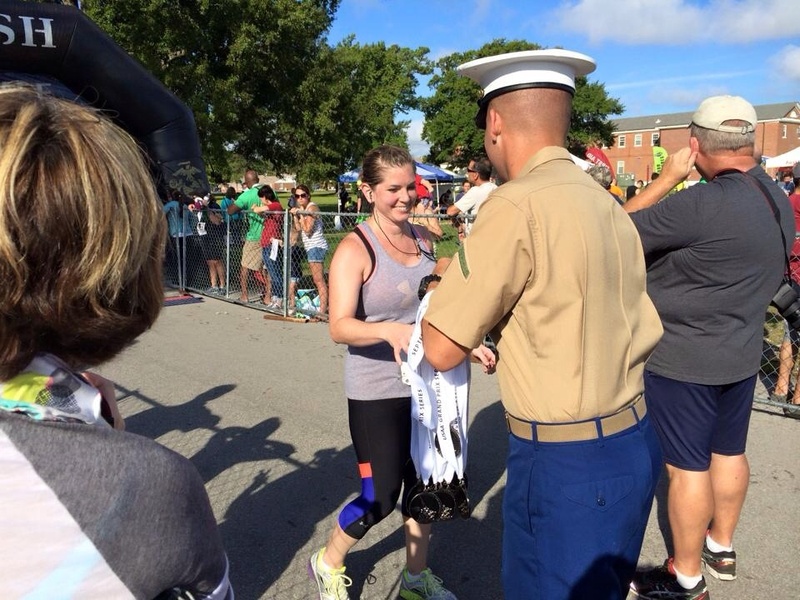 We swapped war stories of the heat and how we managed to push through to the finish. He beat me by about four minutes. He did start out too fast, and really slowed down the last few miles. He was pleased though with his race. We gathered some water and Gatorade, and tried to cool down. Once we did, we walked right over to the car to change clothes. It was nice to be able to do that so easily. The car was right there! I guess that was a benefit to getting there early that morning. We made our way over to the large lawn that was filled with runners, family and friends. They had quite the spread. Tons of food, everything from funnel cakes to hotdogs, and everything inbetween. Fruit, sweets, beer, the list goes on and on. It was very nice. My calves started cramping up the minute I sat down. Even though I tried my best to stay hydrated, the heat, sun and humidity of the morning left me a bit dehydrated. We hung around for the award ceremony, you know, just in case one of us won something. Plus it was just a really nice atmosphere, and much needed recuperation time before driving back home. I’m glad we stuck around! As they began announcing the Half Marathon awards they started with teams, then masters, then age groups. Low and behold, my name was announced! Second place! Then, as they progressed to the younger age groups, my sons name was announced, too. 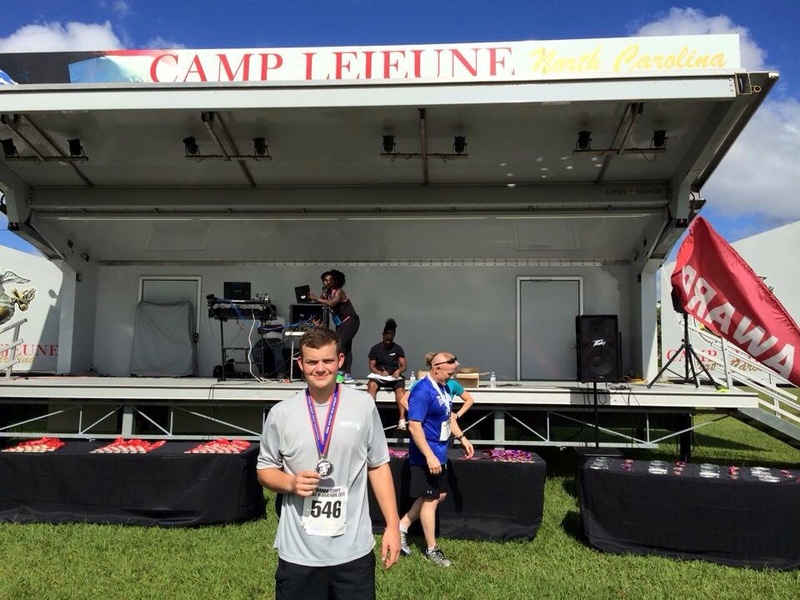 He had won second place in his age group! We were both thrilled! 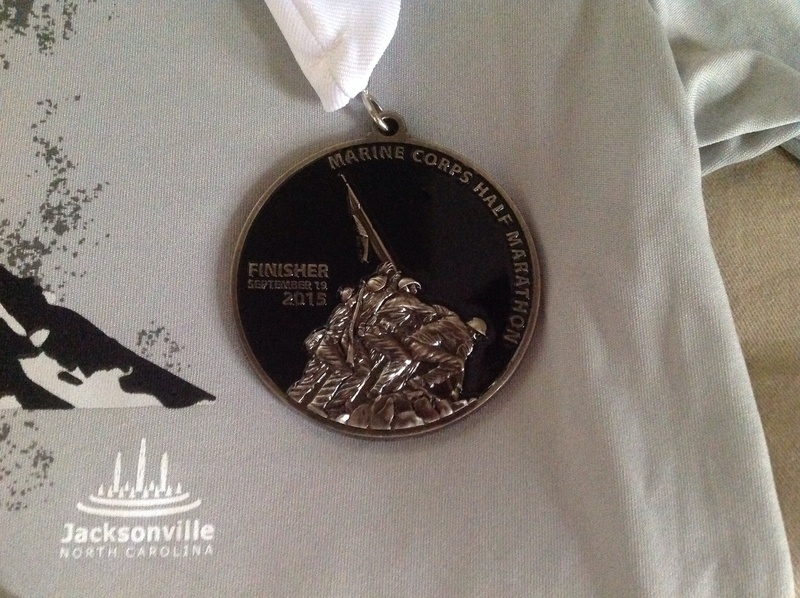 The medals are beautiful, too! We couldn’t have asked for a better way to cap off this event than with an extra medal each! Father and son had succeeded the best we could that day given the conditions. I’m so glad we finally ran this race, and I have to say, may become a tradition for us. A cooler day would have been more optimal, but we had a great time together. I finished 94th with a 1:48:08.